The use of amulets, to protect against danger and misfortune, was widespread in Catholic countries. They were used interchangeably with Christian symbols, and their owners would have been quite unaware of their often pagan origins. The cimaruta, or sprig of rue, was a very common amulet in the Naples area. Rue was believed to have strong protective qualities, which were enhanced by the added designs. The crescent moon with a human face, a grasping hand and a key on this example are some of the earliest symbols found on cimarute. By the end of the 19th century a whole panoply of objects had been added and the cimaruta itself had expanded in size to accommodate them, sometimes reaching over 10 cm wide. Cimarute are still being made today, often cast from old examples complete with their original silver marks. 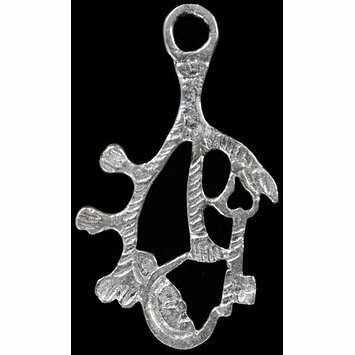 Cast flat openwork pendant amulet in the form of a stylised branch of several arms, one ending in a hand grasping a key, another in a crescent moon with a human face. Silver amulet shaped like a branch with human attributes (cimaruta), Italy, 1850-1890.